It completely disables the hardware based thermal protection provided by the Attansic ATTP1 OTP controller in the center of the CPU socket. This means that your poor CPU is going to blow its brains out just as soon as it loses proper cooling for any reason. Cooked silicon, anyone? Well, I've solved that problem. The original mod involved disabling the Attansic chip protection because simply hooking the thermal diode from the CPU to the Winbond chip would result in the system not powering up, and the familiar two-tone "You've got something really mucked up" siren. The reason for this is because the Winbond 83627HF Super I/O and hardware monitor chip used by Abit has a separate voltage rail for the analog section of the chip (containing the ADC, amplifiers, analog switch, and voltage reference used by the hardware monitors) which is tied to the system 5v supply rail. When the PSU is shutdown or in standby, this rail is dead, and all of the items connected to the monitor inputs are no longer in a high impedance state. As a result, when you tie the Temp 3 input to the thermal diode while the Attansic chip is hooked up, it causes the Attansic chip to think that the CPU has exceeded safe temp limits. So what is the solution? Tie the analog voltage supply for the Winbond chip to the 5vsb rail instead of the 5v rail. The following instructions involve modifying your board and voiding your warranty! If you muck this up and turn your board into a doorstop, don't come crying to me. I will have no sympathy. As before, we will be tying the CPU thermal diode to the Temp 3 sensor channel of the Winbond chip. Step 1. 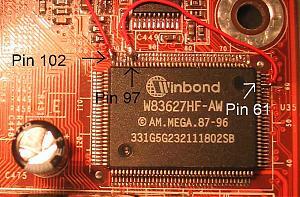 Find pin 97 of the Winbond chip. It is the 6th pin from the top left corner of the chip on the top side of the chip, when viewed with the board oriented so that the I/O panel cluster is at the top right. This is the analog voltage input. You will need to carefully lift this pin from the solder pad. BE VERY CAREFUL! These pins are VERY delicate! Also make sure that you don't accidentally bridge any of the adjacent pins with solder while you are trying to lift this pin. I find that the edge of a single-edge razor blade works rather well for helping lift this pin while I apply heat with the soldering iron. Step 2. Find pin 102 of the Winbond chip. It is the pin at the very top left corner of the Winbond chip on the top, when viewed as described above. Lift this pin just as you did pin 97. Step 3. Find pin 61 of the Winbond chip. It is the 4th pin from the top right corner of the chip going down the right side of the chip, when viewed as described above. This is the 5vsb input. 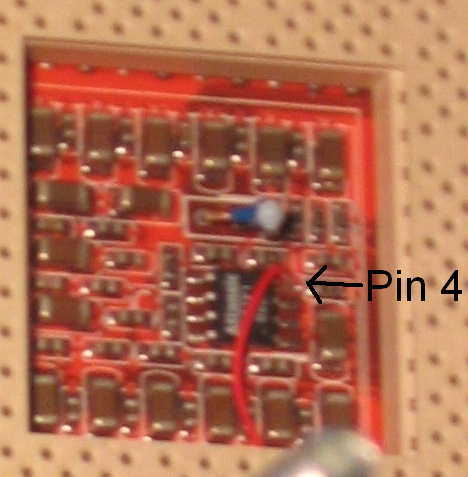 Run a jumper from pin 61 of the Winbond chip to pin 97. BE EXTREMELY CAREFUL! Soldering on these quad flat packs is a real PITA! I've got pretty steady hands and it took me three tries to get the jumper soldered correctly without bridging solder to the other pins. Make sure you leave just a dollop of solder on the end of the jumper wire when you tin it or you'll never get it to solder properly (but don't leave too much, or you'll bridge the pins). 32 guage jumper wire works pretty well. The jumper wire will need to be about 3.5 cm (1.5") long. Solder to pin 61 first, then pin 97. Step 4. Find pin 4 of the Attansic ATTP1 OTP controller inside the CPU socket. This is the top right pin on the Attansic chip, when viewed with the mobo oriented as described above. Step 5. Run a jumper from pin 102 of the Winbond chip to pin 4 of the Attansic chip inside the CPU socket. 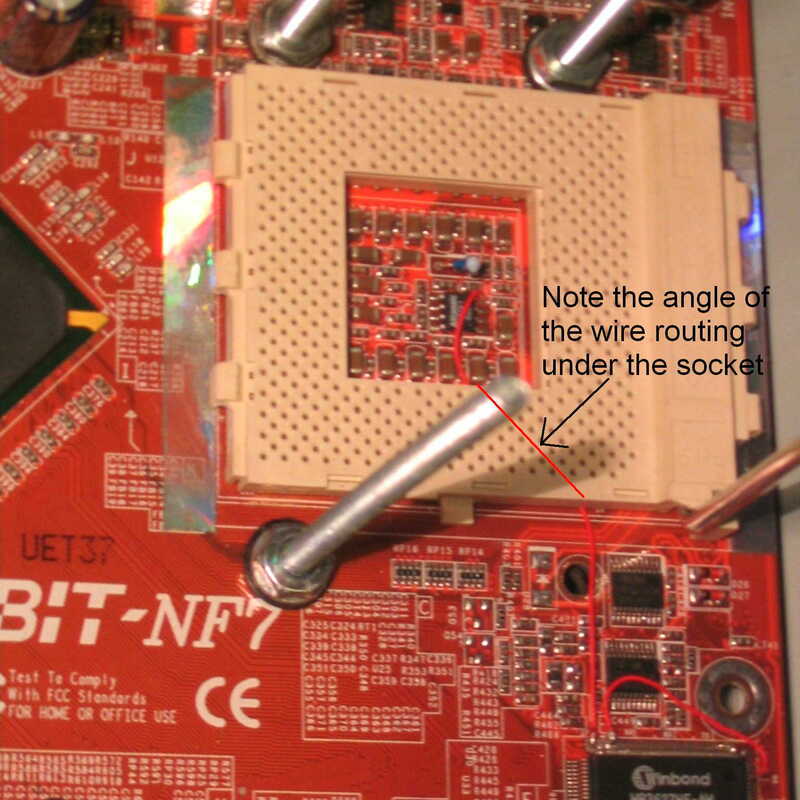 You will find that it is easiest to thread the jumper on the diagonal under the CPU socket between the pins. Anything else is nearly impossible. The wire will need to be about 8 cm (3") long. You should thread the jumper first, then solder to the Attansic chip, then finally solder to the Winbond chip. Step 6. Apply a dollop of gel type super glue or some other fastening agent to each of your jumpers to near pin 97 and pin 102 to keep them from flexing too much and breaking the pins off the chip. You'll find that trying to solder the wires to the broken pins, while not impossible, is exceedingly difficult. That's all there is to it. If you have previously modded your mobo to read the thermal diode, you MAY find that your temps are 1-2 degrees higher than they used to be. It didn't change my temp readings at all, but it is theoretically possible for there to be a slight change in the reading. Now you can safely read your CPU thermal diode temps without sacrificing your OTP protection. I've personally verified this a few times myself, so I know it works. Theoretically, this mod should be able to be done on any mobo that uses the Attansic ATTP1 OTP controller and Winbond 83627HF Super I/O chip, although you will have to investigate the temp sensor input assignments to make sure you have a free temp sensor channel (the Winbond only has three). It CAN be done to ALL of the NF7 based mobos, AFAIK, because the base board is the same with different installed options. Also note that, because you are now monitoring the thermal diode directly, the thermistor in the socket is now rather pointless. This connects to channel two of the Winbond chip, which means you can now use channel two (on pin 101) for something else. I'm thinking about wiring in a thermal probe to check my VCore regulator temp, or maybe my North Bridge, or possibly my GPU. The possibilities are endless! Going to mod this next weekend. Restore mobo mod back to default, only lift up Pin 97 & Pin 102 ? and solder wire on top of Pin 61 & (Pin 4 of the Attansic ATTP1 OTP) ? How to test OTP ? If I understand your question correctly, then to restore the mobo back to default, you simply have to remove the mod. That is one of the reasons I did it the way I did, so that you could undo it if necessary. However, be aware that soldering pin 97 and pin 102 back down is rather tricky because of the fine spacing of the pins. A fine tip soldering iron is definitely a must. As far as testing the OTP, um, unless you have a CPU you are willing to sacrifice, I don't know of a way to test it. In my case, I actually took a chance with my CPU to try it out. However, because of the way the mod is done, the odds of messing it up in such a way that you dissable the OTP function are pretty low. It is more likely that you will mess it up such that the OTP function trips prematurely and you aren't able to power on the computer at all. As for the northbridge, does it have a thermal diode? I didn't think it did. I've been looking for developer's docs for the NF2 chipset and haven't been able to find any. I'm guessing I need to sign an NDA with NVidia to get them. Sorry about this. I use to type in short sentence. because previous i have done this mod, that lifting up the Pin 4 ATTP1 & connecting to Pin 5 (RC network). That what i mean "Restore mobo mod back to default" before using this mod. As for the northbridge, does it have a thermal diode? I believe the AN7 has a thermal probe under the north bridge. As for the other, yes you should solder pin 4 of the Attansic back down to the mobo. You don't need to move the jumper though. It's already in the right place. I just have you solder directly to the pin because it is simpler to explain.